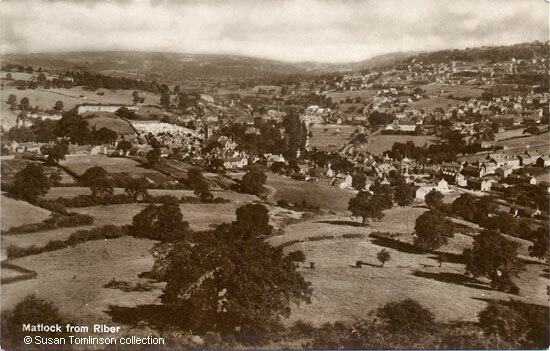 Whilst the Matlock Bank landscape hadn't changed greatly from the previous image, at least not from this angle, there are several significant details that indicate this picture was taken in the late 1920s. The first is the cinema and shops complex on Causeway Lane and the second is the memorial on Pic Tor. The cinema had opened in 1922 and the memorial was unveiled in August 1921. To locate the memorial, look carefully at the quarry face above the gravestones and you can just about make out what looks like a grey streak across the white of the exposed limestone. The view across Hall Leys Park to Crown Square is more open than it had been as the shops at Park Head have been demolished and the tram shelter seems to also have been taken down. Although Matlock had a large cattle market at one time, this had lapsed and by 1924 the town only had a few special fairs each year. The local branch of the National Farmers' Union hoped to revive the market. Unfortunately, the planned market could not be begin immediately because of a Foot and Mouth Restrictions Order and it was not until June 1924 that the first cattle market was held on Matlock Green. Marchant Brooks, the Auctioneers, conducted a poll amongst the attendees to see whether people thought the market should be held weekly, fortnightly or monthly and the majority were in favour of it being held fortnightly. However, cattle markets on Matlock Green do not seem to have been overly successful. The special fairs, held under the banner of Matlock Market, Matlock Green, were held in April and October. Again in 1924, Marchant Brooks advertised an auction of cattle, etc. at two of the fairs on Wednesday 2nd April 1924 (April Fair Day) and on Friday 24th October 1924 (October Fair Day). "Matlock from Riber". No publisher. Real Photo. No date. © Susan Tomlinson collection. "Derbyshire Times and Chesterfield Herald", 23 February 1924. See the section about Matlock Green & Matlock Town on the Matlock, Derbyshire, famous for 19C hydropathy cures page (general history). Marchant Brooks placed advertisements in "Derbyshire Times and Chesterfield Herald", of 8 March 1924 and 18 October 1924.